“…. 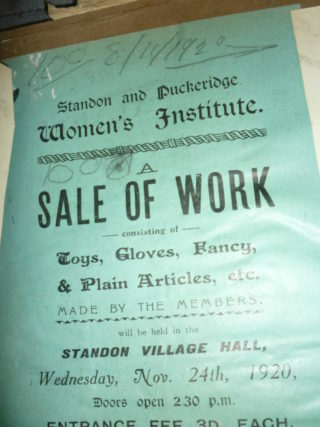 this movement, which had its birth in Canada and is now spreading over the whole of Britain under the auspices of the Board of Agriculture, has for its object the banding together of country women, for cooperation, instruction, recreation and the starting or revival of local industries, and the improvement of rural life generally. …. 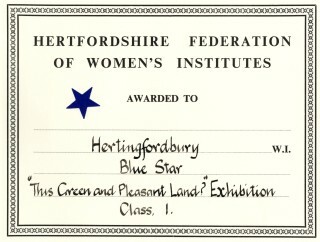 The number of Institutes in Hertfordshire is steadily increasing (22 are at present in existence) and in every village where an Institute has been established, it is universally admitted that this movement is one that offers innumerable advantages to country women of all classes, and which is full of immense possibilities for the future”. 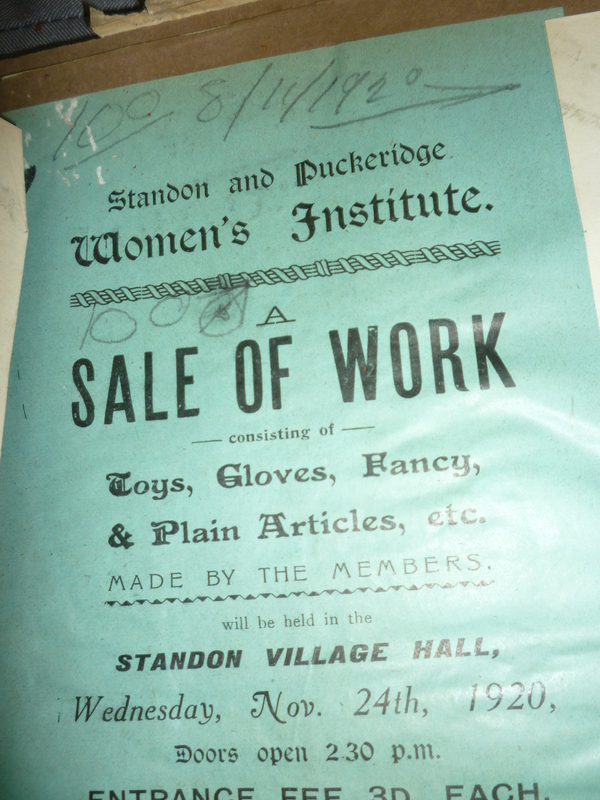 A fur glove industry was set up in November 1918 and 40 pairs were made in following month with a result that Northaw distinguished itself at the Caxton Hall Exhibition of Women’s Institutes’ work with a 1st for fur gloves with cured rabbit skin, plus a 2nd for chutney, bread and best cake and a 3rd for a blouse. 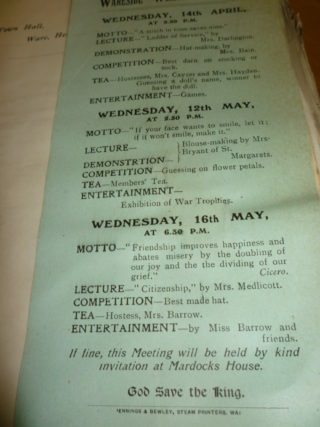 Best cured rabbit skin (with Miss Pollock from Northaw to be invited to judge and give hints). The formation of a choral society. Mr Crofton to be asked to re-start the parish magazine. Discussion of celebrations of peace and war memorial. More WIs were formed with a similar pattern of programmes. 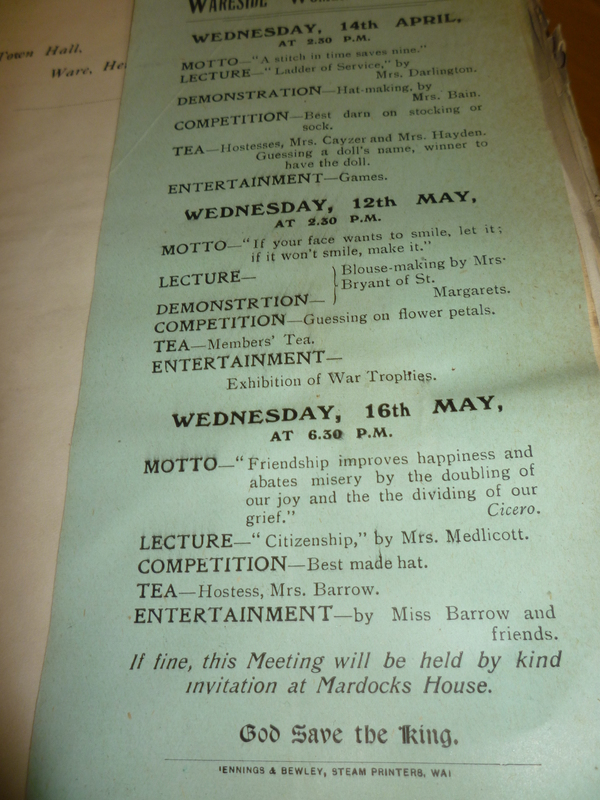 The 1920s saw Walkern W I organising demonstrations and lectures on toy-making, poultry keeping, fruit bottling, simple home remedies, rug making, willow basketry, millinery, upholstery. [v] However, members were encouraged to think beyond the home. Northaw W I took up the plea for eggs for the wounded and was able to record that, during 1918, 155 eggs had been collected and “It says a great deal for the packing that every egg has been acknowledged unbroken”. The egg collection continued after the war with Walkern W I sending 122 to Hertford Hospital in 1923, 225 in 1925 and 139 in 1929. In addition, a Bring and Buy raised £11.11.10 for the hospital. There was concern about the upkeep of the war memorial in Walkern. 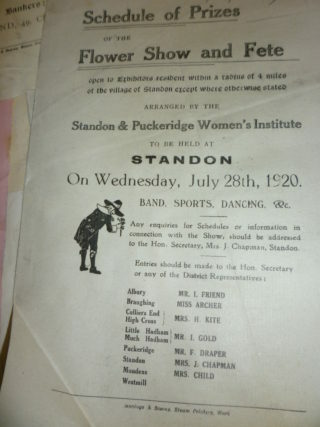 In 1929 it was recorded that “the WI has taken over the care of the War Memorial, several of the committee met during the past week and gave the stone a good clean. The Parish council have consented to provide a small lawn mower for use on the grass“. During the 1914 – 1918 war, women had been encouraged increase the stock of home-grown food, notably jam. It was thought that the Canadian system of Institutes for Women would be a useful way of organising this. Gertrude, Lady Denman, a suffragist with political and administrative experience, was invited to become the leader of the W I movement. She saw benefits in its continuance after the war as a way of educating women and thus increasing their confidence to effect change in matters that affected their everyday lives. The extension of the suffrage in 1918 meant that many women had the vote. In 1919, Codicote WI invited Mr G M Kindersley to speak on “Why rural and Parish Council elections should interest us” and the talk at Northaw in September 1919 was on women’s responsibility with regard the vote. The formation of a W I was to empower women. 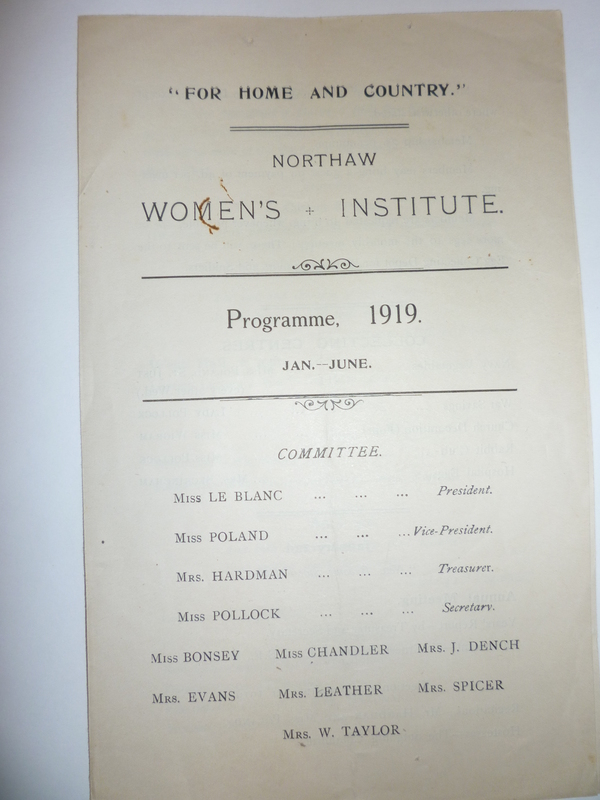 When it came to a discussion of a letter in April 1920 from headquarters asking if Northaw WI thought that a Men’s Institute would be of service in the village, “The Committee decided that it would not be suitable”. “That in view of the rough condition of the byeroads, which, owing to weather conditions and modern traffic are little but loose stones, thereby imposing a heavy burden on the parents of school children in providing them with footwear, this Council urgently desires the County Council to attend to the matter with the least possible delay”. 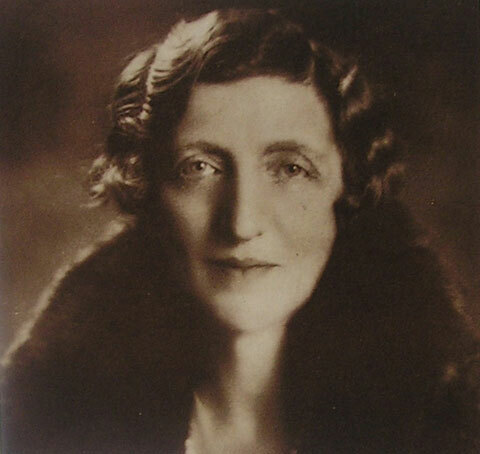 Walkern’s resolution in 1933 was “In view of the acknowledged national importance of Education and the extent of public expenditure on it, the Walkern WI wishes to propose that the NFWI Executive Committee be asked to collect authoritative information on conditions influencing the health and fitness of children of school ages and circulate this to the WIs for propaganda purposes“. The school leaving age had been raised to 14 but when did a girl become a woman? 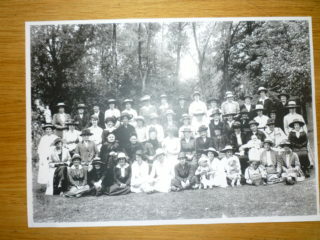 Hertingfordbury W I decided that no one under the age of 15 could join. On the other hand, Walkern W I had a discussion on whether girls of 14 should be allowed to be members. As some objected, it was unanimously agreed they should be allowed to join with the reservation that they could be barred from certain lectures. 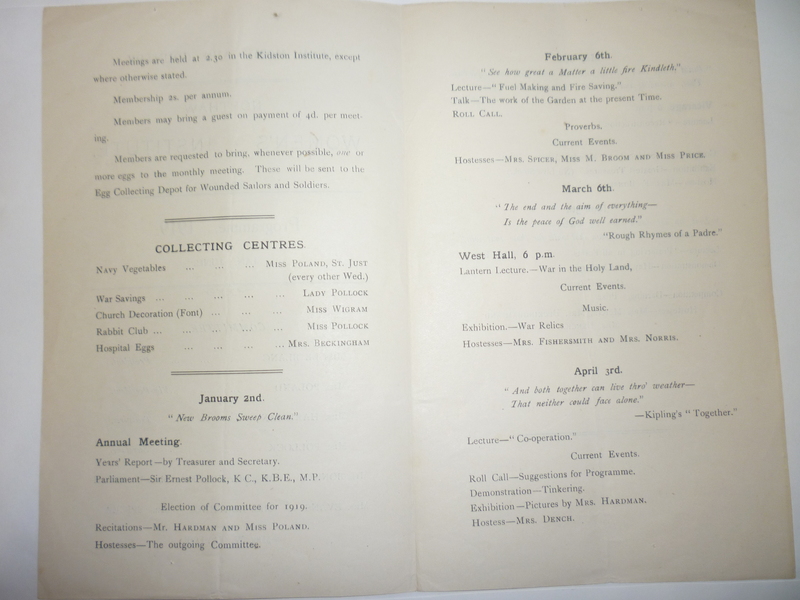 The minutes of the Walkern W I record that their December1927 meeting opened with the singing of “Jerusalem”. The leaders of the W I had, in 1924, agreed that the suffrage hymn, Hubert Parry’s setting of William Blake’s poem, “Jerusalem”, should become the song of the W I. Achievement of a vote was just the beginning. 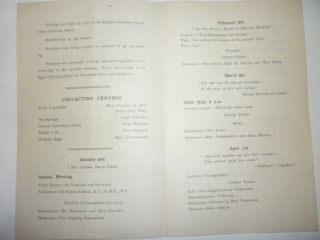 For some memories of the 50th year of Hertingfordbury W I click here. *The various charities joined to form the National Birth Control Council in 1930. Lady Denman was invited to be its first Chairman. Gertrude Denman’s maiden name was Pearson. Her grandfather, George Pearson, bought “Brickendonbury”, Hertfordshire, in 1893 which passed to her uncle, Edward. 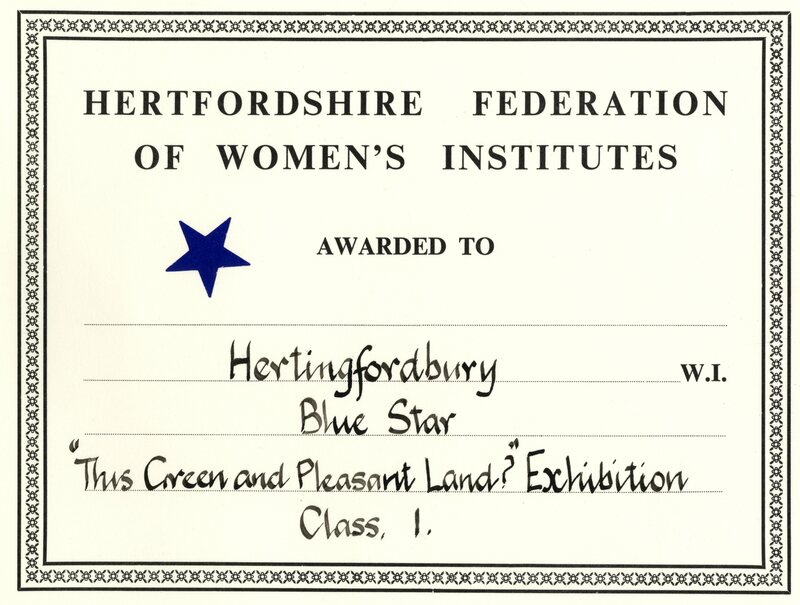 A copy of a brief biography, “Lady Gertrude Denman – A Practical Feminist – 1884 – 1954″, written by Gill Cordingley and illustrated by Gillian Harman, is available at Hertfordshire Archives and Local Studies (HALS). [ii] HALS/D/EX268/Z10, W I Record Book, Northaw. [iii] HALS/AEC7, 9 February 1920. [iv] HALS/D/EX494/1, Codicote W I. [v] HALS/ACC3810/9, Walkern W I..
[vi] HALS/HV91A/4, Minutes of QVM Hospital.